Fall is officially here and that means that gardening is coming to a halt for the year. I've been spending a lot of time preserving my fresh veggies and herbs for the winter. I use herbs in so many different things that I just can't be without them! I've dehydrated and stored almost all of my herbs from the garden, except for a few. While I'm really glad I can dehydrate herbs to store them, I would much prefer to use fresh herbs. I use herbs in medicinal teas for basically anything that ails me. From headaches to sleeplessness, I turn to herbs before store bought medicines so it's important I have them on hand. 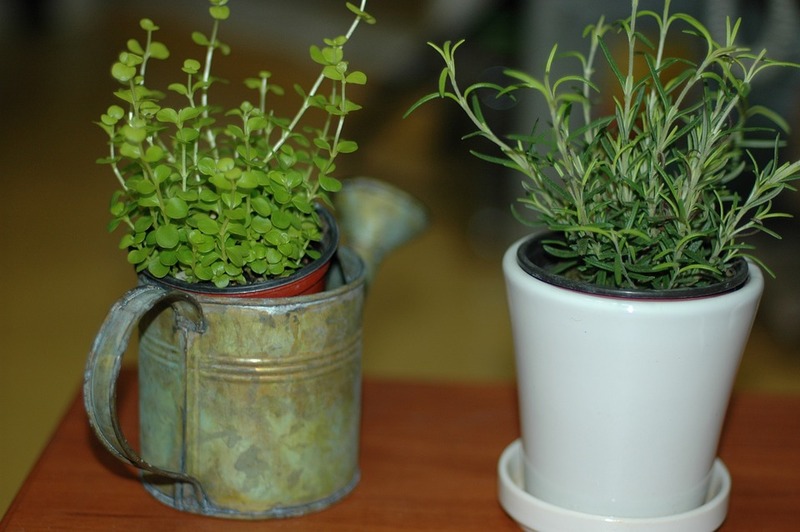 Luckily there are some herbs that do really well indoors in pots. As an added bonus they Help To Clean The Air Inside Your House! I don't have very sunny windows and even I can get most of these to flourish indoors in winter! These medicinal herbs are easy to grow, even for beginners. Let's get to the list of plants I grow inside the house in winter and their uses, and I'll add some growing instructions below that! Accelerates the healing of burns. Treats mouth ulcers. Reduces constipation. High in amino acids. Alkalizes the body and boosts the immune system. Natural anti-inflammatory. Has anti-bacterial properties and is very high in antioxidants. It can be used to soothe the stomach, calm a cough or take the sting out of a bug bite. More information: 7 Ways To Use Basil As Medicine. Calms nerves. Soothes stomach. Can help alleviate menstrual cramps. Helps with migraines and improves digestion. More information: Growing & Using Catnip For Tea. Promotes healthy digestion. May reduce arthritis pain. Helps control cholesterol levels. Detoxifies the body. High in vitamin C. May help with insomnia. Reduces stress and anxiety. Improves appetite. Promotes restful sleep. High in antioxidants. Supports the liver and promotes balanced blood sugar. Soothes an upset stomach and reduces nausea. Repels mosquitoes. Increases alertness. Helps lessen headaches. Relieves congestion. Boosts immune system. Helps detox the body. Improves heart health. Contains calcium, iron and manganese which are essential to good bone health. Aids digestion. Has anti-inflammatory, antibacterial and anti-fungal properties. Often used as a diuretic. Fights bad breath and is high in several vitamins. More information: 13 Reasons Why Parsley Is The Healthiest Food In Your Kitchen. Anti-inflammatory. Often used for arthritis and gout. Stimulates brain function. High in vitamin K. Aids in digestion and can be used for skin issues. Boosts immune system and memory. Helps relieve migraines. Anti-inflammatory and antibacterial. Helps to improve mood and lessen stress. Antibacterial and antifungal properties. Boosts circulation and immunity. May help improve vision and relieve stress. Make sure your medicinal herbs get enough sun. A south facing window is probably the best bet. With the exception of aloe, all your potted plants should be placed in direct sun. Aloe prefers indirect sun so place it slightly away from the window. Aloe, rosemary and lemongrass are not cold hardy at all. I grow these three in pots year round, putting them outside in summer and bringing them inside in winter. They enjoy being outdoors for summer to enjoy the sun and heat. They need to be brought indoors for winter in colder climates though since a good freeze will kill them. Since I bring them in every year I just leave them in pots. I'd rather not mess with planting and repotting if I don't have to! Lemon balm, parsley, thyme, oregano and mint have all over wintered in the ground for me. (I'm in zone 6, we get about 3 months of snow) You can move them to the garden in spring, then root a cutting by putting it in water to grow a new plant indoors for winter. Harvest herbs from the plant in the ground during summer and from the plant in the house during winter. Basil, catnip and sage grow wonderfully when put in the garden in spring but will not last through winter. 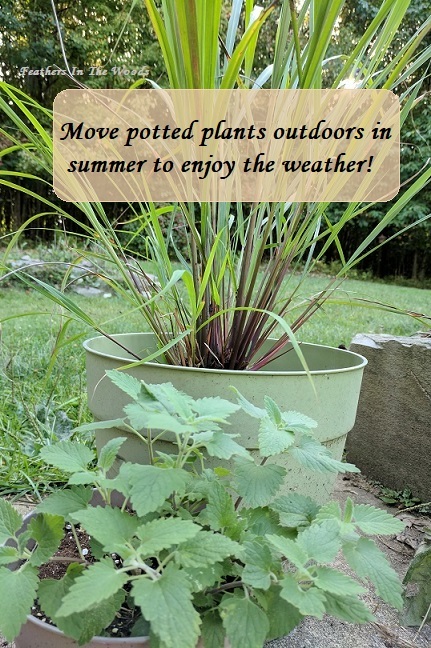 You can root a cutting by placing it in water mid summer and have a new plant ready to be potted by fall. I like rooting new plants from cuttings as opposed to planting seeds. (here's a good tutorial from BHG) There's much less work and you can see within a week or two if it's rooting. If you don't have a garden to move plants to in spring, aggressively pruning them can help them to not outgrow their pots. Happy gardening! 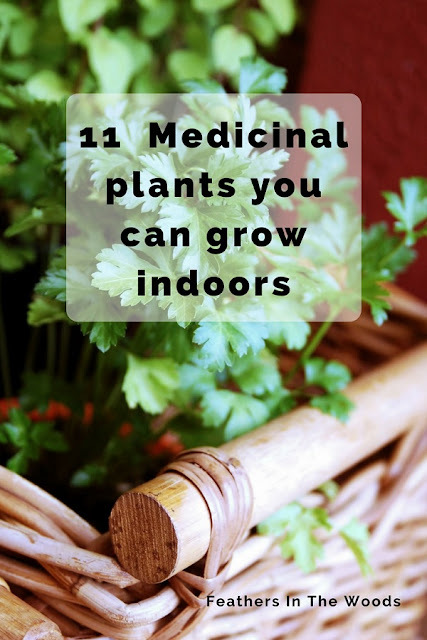 Want more posts on indoor plants? Click here for my other posts on indoor gardening. Want healthy living information sent right to your email weekly? Click right here to join my list and get new posts sent directly to you the day they're published! I am not a doctor or other health care professional nor do I claim to be. I am simply passing on information that has worked for me. This information is not medical advice and is for entertainment purposes only. Please see a Dr if you are ill. Click for my full disclosure. Sweet post, I pinned it so I can reference it later. Especially during winter when I am eager to play in the dirt when snow is covering the ground. Thanks for sharing this at the Dishing It & Digging It Link Party. I really enjoyed this Lisa. We're very fortunate living on the Highveld in South Africa that most of ours herbs can stay outside all year round without us having to worry about it getting to cold. That being said though, there's just something about growing herbs indoors that I love. I did not know that these herbs had so many medicinal properties! I am not good at taking care of plants, but someone said that taking care of herb plants are easier than regular floral plants, so that is something I may try someday. Also, I know that there are essential oils that come from these plants, and I was wondering if they had the same effect as the plant. Herbs plants are pretty easy to care for. They generally only need a sunny window and watering every other week or so. Essential oils are made from herbs so you would be able to get similar effects from a cup of herb tea or if you dried and used the herbs to make lotion, tincture or even filled capsules. I never realized you could grow aloe all year round... that's so good to know... I'm gonna give it a try... thank you! Yes! It has to be indoors during the winter in most zones, but it can be taken out for summer and brought back in each year. Thanks! Yes, I'd much rather use a fresh herbal remedy thank a chemical potion from the drugstore! I already have several of these growing! I have two aloe plants, three small basil plants and two mint plants inside! I also have rosemary and oregano outside! That is awesome! Unfortunately rosemary won't grow outside here so I have to bring mine in every winter. It is great to see your suggestion on these growing indoors.